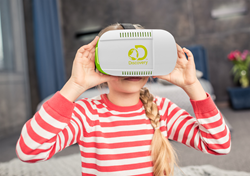 New Discovery Kids VR Headset from Sakar! Sakar International, a leading provider of consumer electronics and accessories since 1977, is helping families get ready for the holiday season with a range of enjoyable new licensed products including children’s virtual reality headsets, dance mats, karaoke machines, and more. Each of the new additions will make the perfect gift for the curious child in your family this holiday season. Discovery Virtual Reality Headset: Features a 3D video experience drawing inspiration from the Webby award winning Discovery VR content, transforming any smartphone into a 360-degree virtual reality viewer. The headset is fully compatible with any smartphone device. From Shark Week to Everest Rescue, the Discovery headset offers the opportunity to have experiences which transport kids to places they didn’t know existed while sparking curiosity at every turn. It is sure to add the wow-factor to any child’s virtual reality experience. -Play along to "All you need is Love" and "Yellow Submarine"
Hatchimals MP3 Microphone: Take center stage, with the Hatchimals Karaoke Microphone. Designed with the super-star Hatchimal-lovin' singer in mind, this MP3 microphone gives children the power to customize their performance to sing with (or without) accompanying vocals. For an enhanced experience, this microphone comes with built-in crowd cheering audio, so kids can hear the wonderful applause after a whirlwind performance. Battery operated this karaoke microphone runs on 3 AAA batteries (not included) and works well with any iPod or MP3 device. The My Little Pony Movie Deluxe Karaoke: Kids will love singing along to their favorite tunes with the Sakar International My Little Pony Karaoke with Screen. Your child will spend hours rocking out to popular music, while enjoying his or her favorite My Little Pony characters. This Sakar International karaoke machine connects to any TV for amplified sound while CD+G lyrics display on the TV screen, allowing kids to read along as they sing. It also connects to ios devices and other MP3 and tablet devices. Or, connect this karaoke machine with screen to a CD player to play music while singing right along. It comes with a CD+G disc inside which features two hit songs: "Counting Stars" and "Love Story." This player comes with cables needed to connect it to iPods or MP3 players. These products will be available in Walmart, Target, and Toys “R” Us stores nationwide this holiday season. For more information, please visit http://sakar.com/. Sakar International, Inc. is a leading provider of consumer electronics and accessories. With a rich heritage of technology innovation since 1977, Sakar has developed a global presence by consistently evolving alongside technology to develop on-trend, cutting-edge products. Sakar licenses over 40 major entertainment and corporate brands and has maintained a diverse portfolio of product offerings, including digital and action cameras, audio and mobile accessories, karaoke machines, musical instruments and additional youth electronics. Sakar is the parent company to Vivitar, a full-spectrum consumer tech company specializing in the production of cameras, camcorders, mobile accessories, and health and wellness products. Sakar is headquartered in Edison, NJ, with additional offices in the United Kingdom, Canada, Latin America, Australia, Hong Kong and China. For more information, visit http://www.sakar.com.